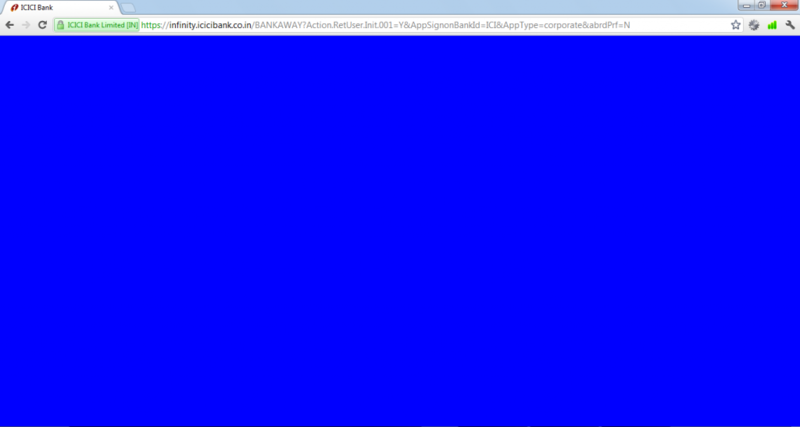 Thousand of ICICI bank internet banking users are facing a problem When the go to the final page of ICICI bank, a blue window opens up like this. We checked the same in other browsers like IE, Firefox as well as Safari and the site seemed perfectly fine. Now is this a Chrome effect or problem with the site. Companies are supposed to do rigorous testing in the main browsers before launching of the sites as they carry security implications. Chrome happened to be a favorite choice for icici bank net banking users because of the speed and the interface but such an issue has raised eyebrows on the security as well as credibility of browsers as well as how the sites are being built. There can be just a bug fixing going on or may be some maintenance work but it can be fatal for credible service providers like ICICI. Or is that really the problem with chrome? Lets wait and watch for what these 2 giants have to say for it.